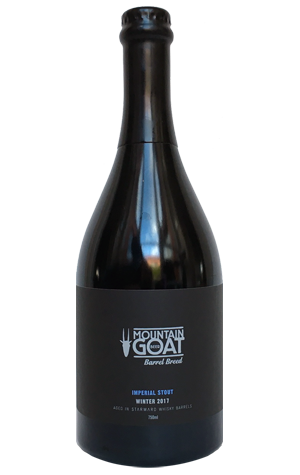 Perhaps understandably, what is now Mountain Goat's annual barrel aged imperial stout release has lived in the shadow of its predecessor. The first beer to come out of the Barrel Breed program was the Barley Wine that took out Champion Australian Beer at the 2015 Australian International Beer Awards – the most prestigious gong a beer can win in Australia. But this could be the year the winter release steps out of the shadow as, while this year's Barley Wine is a beer that should improve as it mellows over time, the Imperial Stout comes fully formed and ready to bowl you over with its obscene succulence. As with this year's Barley Wine, the barrels in question came from Starward and contributed so much intense whisky character that the brewers had to tone things down. Having combined the liquid from 13 of the 15 barrels they filled (two didn’t make the cut), they then blended it with a fresh sweet porter. So, while the whisky character remains, it's part of a broader picture rather than a dominator. That broader picture is a sweet treat, one that hits you with its rummy, chocolaty goodness long before the glass even reaches your mouth and adds dark fruits, treacle, molasses, vanilla and Vietnamese ice coffee to the mix as it warms. One to savour with mates.